dwm is a dynamic window manager for X. It manages windows in tiled, monocle and floating layouts. All of the layouts can be applied dynamically, optimising the environment for the application in use and the task performed. In tiled layout windows are managed in a master and stacking area. The master area contains the window which currently needs most attention, whereas the stacking area contains all other windows. In monocle layout all windows are maximised to the screen size. In floating layout windows can be resized and moved freely. Dialog windows are always managed floating, regardless of the layout applied. Windows are grouped by tags. Each window can be tagged with one or multiple tags. Selecting certain tags displays all windows with these tags. Each screen contains a small status bar which displays all available tags, the layout, the number of visible windows, the title of the focused window, and the text read from the root window name property, if the screen is focused. A floating window is indicated with an empty square and a maximised floating window is indicated with a filled square before the windows title. The selected tags are indicated with a different color. The tags of the focused window are indicated with a filled square in the top left corner. The tags which are applied to one or more windows are indicated with an empty square in the top left corner. 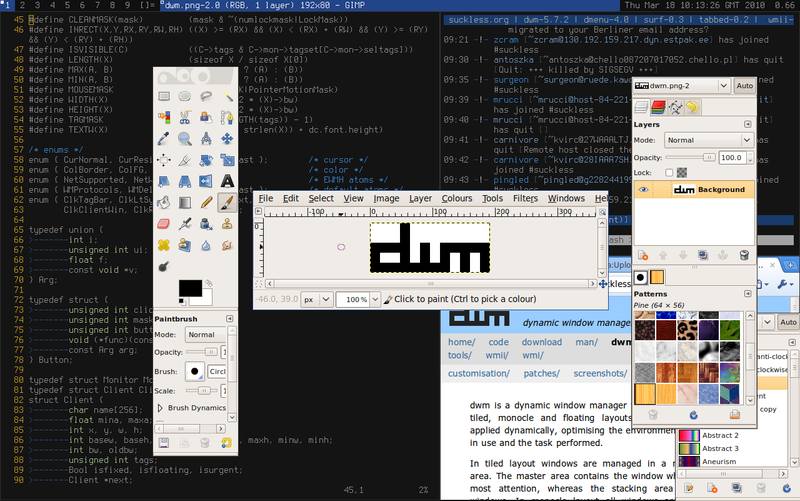 dwm draws a small customizable border around windows to indicate the focus state. In contrast to ion, larswm, and wmii, dwm is much smaller, faster and simpler. dwm has no Lua integration, no 9P support, no shell-based configuration, no remote control, and comes without any additional tools, such as for printing the selection or warping the mouse. dwm doesn't distinguish between layers: there is no floating or tiled layer. Whether or not the clients of currently selected tag(s) are in tiled layout, you can rearrange them on the fly. Popup and fixed-size windows are always floating, however. dwm is customized through editing its source code, which makes it extremely fast and secure - it does not process any input data which isn't known at compile time, except window titles and status text read from the root window's name. You don't have to learn Lua/sh/ruby or some weird configuration file format (like X resource files), beside C, to customize it for your needs: you only have to learn C (at least in order to edit the header file). Because dwm is customized through editing its source code, it's pointless to make binary packages of it. This keeps its userbase small and elitist. No novices asking stupid questions. There are some distributions that provide binary packages though. dwm creates a view for each Xinerama screen. See the faq for the frequent problems that arise. The next step is to look at the sourcecode and the config.h for obvious names, which could be related to the problem that arose. If that does not help to fix the problem, then there is the #suckless IRC channel and the mailinglist. If it is your first time using dwm, start with reading the tutorial. Optionally you can install dmenu to extend dwm with a wmii-like menu.